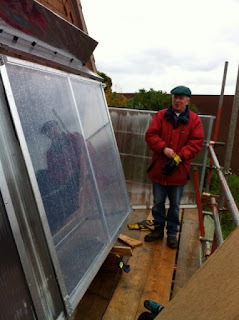 28 October 2012: Winter has arrived, the hours are shorter, it rained almost all day on Sunday 28 Oct, but I had an imperative to get the Sunbox re-fronted with the Holscot ETFE frames because I am going to be paying weekly charges for the scaffolding. 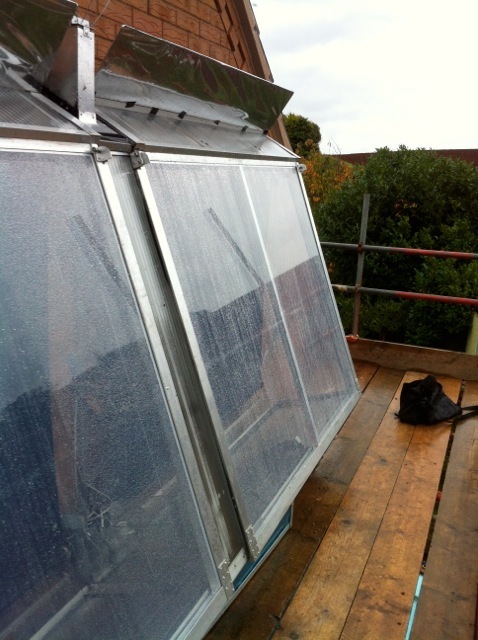 The ETFE panels are still in their packaging on the left, but I have taken one of the polycarbonate fronts off the right hand sunbox. 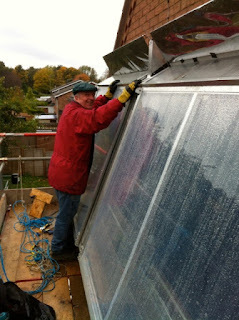 Here I am getting the ETFE panel out of the packaging, terrified of accidentally puncturing it. Luckily the wind from yesterday has ceased and it was easy to handle the large panels. It turned out to be impossible to position them alone, and one of the Sharphill forestry group, Bill Logan happened to be walking past the house at that exact moment and offered to climb the scaffolding and help out. Thanks to my very accurate fabrication the week before and with the help of Bill, the panels slipped into place very easily. 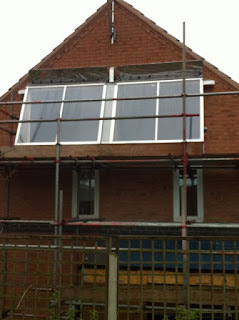 Here's the first of the panels, with a holding bolt at the top hinges. 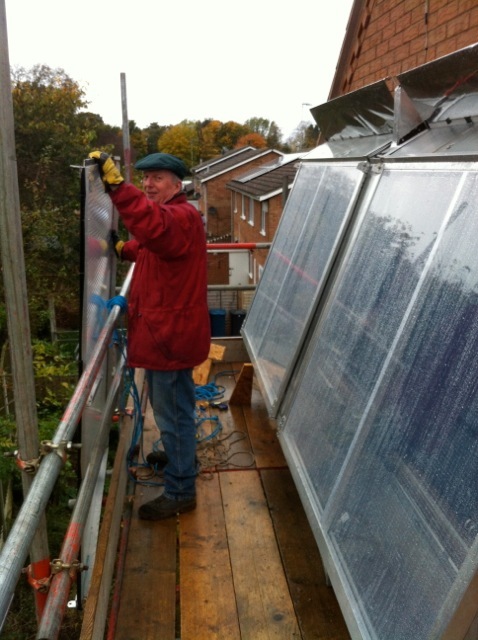 We try the left hand panel, and Bill is holding it in place (without the hinge bolts fixed yet) hence the nervous expression. Didn't take long to fix the bolts and make it safe! 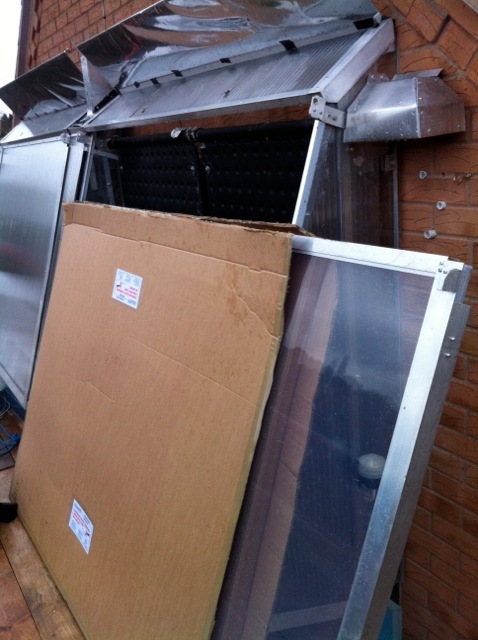 We then lowered the triple-skin polycarbonate panels to the ground. Note how much rain had fallen just in the short time we were up there. First view of the new ETFE panel fronts, now allowing people a view of the interior. 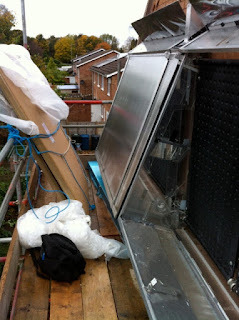 The ETFE is not optically clear, but it is transparent to thermal energy. In the remaining daylight, I secured the lower parts of the frame to ensure that they remain reasonably airtight. I am not sure if I can re-use the 'bonnet-stay' detail, but I will do so if I can find a way to adapt it. I will modify the detail at the top hinges next time I get some daylight. Sunday, it has been very grey all day and spent most of its time raining, so I am looking forward to the next sunshine to test out our new ETFE fronts. I am very tempted now to remove the MIRRORs as the performance boost they gave the old panels is probably not needed.